Have you ever forgotten to pay a bill? I imagine it’s happened to everyone at some point. One of the first months we were married, I went to pay a credit card bill and realized I hadn’t paid the previous months’ bill. I didn’t make that mistake twice! We were on an aggressive path to get out of debt and couldn’t afford mistakes like that! Since then I’ve relied on my Mini Kitchen Office filing system with a folder for bills that need to be paid, and a folder for paid bills and other paperwork that needs to be filed. This month I added another piece to my bill organization system that might be helpful if you’ve recently taken over the task of paying your household’s bills. 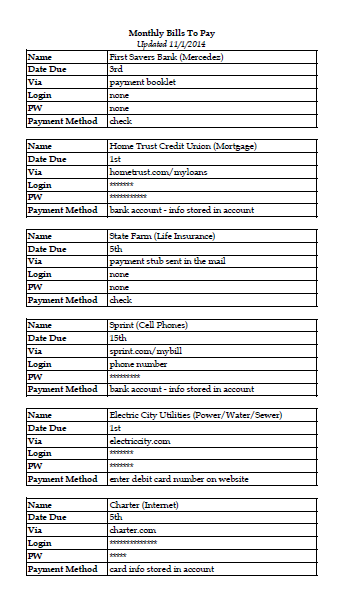 I created a list of all the bills we pay, with all the pertinent information I use to pay that bill. Not only will this help me remember every bill I need to pay, I printed a hard copy for my “bills to pay” folder. If my husband had to pay the bills one month, he has all the info – including the logins and passwords that are saved in my brain. I created a sample of the list for you to see (don’t worry, none of these are actual companies that we use). If you have a method of keeping your bills organized, I’d love to hear about it! I pay the bills at our house and there has been a time or two when something slipped through the cracks. I remedied it by making a spread sheet of each bill that had to be paid during the month. I need to type out passwords and account information because I’m inevitably forgetting the key information. I love that you have a system where anyone could walk in and pay your bills. Way to go!! I have a little letter holder that I got at Target and the bills I pay go in there so I remember to pay them. I love your idea of a list of monthly expenses, what is paid on line etc. My husband does most of the bill paying so I really do need this. Thanks for sharing. We also use a Quicken budgeting program, mint.com (free! ), which sends reminders to our email when a bill is coming up. I’ve heard of that but haven’t ever used it. Thanks for sharing! This is brilliant. I will be printing this for my benefit! Thanks, Whitney!